Making a beaded ring with only wire and three beads is an easy wire project for just about anyone. You can literally make one in five minutes with some practice. Here's a tutorial on how to make this simple beaded ring by Gail Jones. Gail uses her own custom mandrels to make these rings but you can easily substitute a regular ring mandrel, a piece of dowel, or even a Crayola marker. All you need is the right thickness. If you don't have a ring mandrel with sizing, one of Gail's ring guide, or you're not sure of your size, make a sample ring out of practice wire using your marker, dowel, or ring mandrel. Slip your sample ring onto your finger to check for fit. I have some 20 gauge copper wire from the hardware store that I like to use for practice wire. 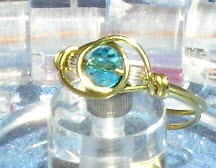 Throughout this tutorial, Gail shows how to make a ring using her guide. If you are using a differnet mandrel, just substitute as needed.